Static-X’s decision to reunite for a new album and a “Wisconsin Death Trip” 20th anniversary tour was met with some controversy due to the strained relationship and legal dispute between the late Wayne Static and Tony Campos. 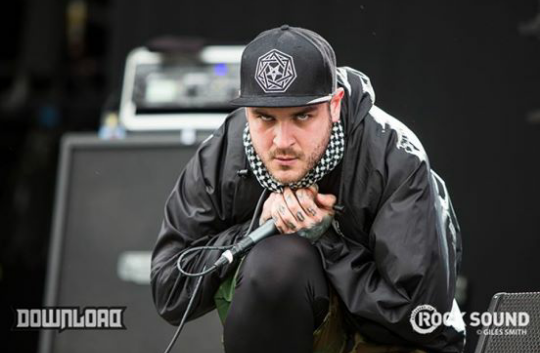 Among those that took issue with the reunion was Emmure’s Frankie Palmeri, who recently told the BREWtally Speaking Podcast that it was a “cash grab.” Now, Static-X’s tour manager Eric Dinkelmann has blasted Palmeri for his comments, while also blaming Static’s late widow Tera for causing problems in the band and getting the frontman hooked on prescription drugs. For credibility purposes I’ll start by stating I met Static-X while I was touring on Ozzfest ‘99. I became friends with the band and started working with them back in 2001 as a videographer for the tour DVD bonus footage. I went on to become band assistant, security, merch designer, Assistant TM, and eventually worked my way up to Tour Manager. I even designed the version of the Static-X logo for Wayne’s solo version of the band, as well as the new current Static-X logo. Wayne Static wasn’t Static-X. This isn’t a NIN scenario where Trent Reznor is Nine Inch Nails. Static-X was always a partnership and was 50/50 between Wayne + Tony. Wayne never wrote 100% of the music. Sure Wayne was iconic to the band, but it was a collective and a partnership. That is fact and why Wayne needed permission from Tony to use the band name later. Emmure wasn’t even around during the hay day of Static-X. I don’t remember this guy at a single one of our shows and Emmure wasn’t picking up steam till after Tony + Wayne had their split. After this happened Wayne lost a lot of money and upset promoters after pulling out of the tour. With this in mind rumblings of lower guarantees started happening and Wayne wanted to change the financial agreements to use the name. Wayne tried to lie to Tony about why he wanted to change the terms of what Wayne had already agreed to and cut Tony out of what he was owed. Wayne put himself in this position and tried painting Tony out to be the bad guy. I don’t remember Frankie tearfully calling me to tell me Wayne passed away on the afternoon of Nov 1, 2014 before hit it the internet or press, but I certainly remember Tony + our crew calling me. We were all shattered especially because we didn’t get the chance to mend our relationships because of Tera. As we all know though, you’re not going to come between a guy and his wife if she’s still in the picture. Twiztid have revealed the details for their annual “New Years Evil” show. The event will take place at the Reverb in Reading, PA on December 31 and in addition to Twiztid it will feature: Emmure, Alla Xul Elu, Islander, Lex The Hex Master, Sharptooth, Degrader, and Bloodbather. A number of musicians took part in a special tribute for the late Vinnie Paul Abbott (Pantera, HELLYEAH) during the Aftershock Festival in Sacramento, CA yesterday (October 13). You can see some fan-filmed footage from the set below. Among those who perfomed were Korn’s Jonathan Davis, Godsmack‘s Sully Erna and Tony Rombola, HELLYEAH‘s Kyle Sanders, Deftones‘ Stephen Carpenter, Act Of Defiance‘s Chris Broderick (ex-Megadeth), Sevendust‘s Clint Lowery and John Connolly, Shinedown‘s Zach Myers, GWAR‘s Blothar and Pustulus Maximus, Kyng‘s Pepe Clarke and Eddie Veliz, Emmure’s Frankie Palmeri, Hyro The Hero and more. It’s also worth noting that Abbott’s drum set was used for the set. This year’s Louder Than Life and Aftershock festivals will be hosting some special all-star tributes for the late Vinnie Paul (Pantera, HELLYEAH, etc.). The sets are being curated by SiriusXM’s Jose Mangin and they will feature various artists performing Pantera and Damageplan covers. Louder Than Life: Five Finger Death Punch, Godsmack, HELLYEAH, Sevendust, GWAR, Bullet For My Valentine, Body Count, Kyng, Cane Hill, and more. Aftershock: Korn, Godsmack, Deftones, HELLYEAH, Shinedown, Sevendust, GWAR, Kyng, Emmure, and more. Louder Than Life will be held on September 28-30 at Champions Park in Louisville, KY and Aftershock will be held on October 13-14 at Discovery Park in Sacramento, CA.